Mount Everest, in Tibetan CHOMOLONGMA, was first recognized as the worlds tallest in 184, the stunning scenery in Everest region has been acclaimed since the first British expeditions attempted to climb Mount Everest in the 1920s. With the advent of the tourism and trekking in China during the early 1980s, Dza Rongbuck Monastery and the nearby base camp quickly became Tibet's most popular trekking destination. The best time for tour & trekking to Mount Everest is generally between May to October. We offer 10 Days Tibet Overland with EBC “drive-in & fly-out” program for people who want to realize the aspiration for tour & trekking around world’s highest peak CHOMOLONGMA. This trip starts early morning at 05:30 am from ADVENTURE SILK ROAD INC office at Thamel opposite KC’s restaurant & before Hotel Excelsior. The distance from Kathmandu to the Friendship Bridge, Kodari (Nepal/Tibet Border) is 116km and takes a 05hrs on drive. After completing immigration formalities on the Nepal side we continue drive / walk to Zhangmu Immigration, which is 09km away. 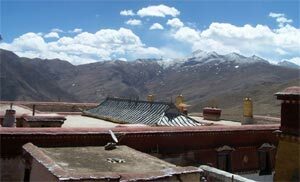 At Zhangmu, our representative from Tibet will meet you and transfers you to the hotel. He will then take care of your entire tour arrangements till your departure from Lhasa to Kathmandu or abroad. The detailed itinerary is as below. From Shegar The Everest access road turns off the Friendship Highway around five km west of Shegar check point shortly after km market 494, from which point it winds and climbs its way 63 km to Rongbuk Monastery and on to base camp. Although there were probably monastic settlements in the area for several hundred years, Rongbuk Monastery is fairly recent. It was established in 1902 by a Nyingmapa Lama. Perhaps not of great antiquity, it can at least lay claim to being the highest monastery in Tibet and thus the world, at 4980 meters. There were once 500 monks and nums living here but local reports that the number is now only 16. Accommodation and very basic food are available at the monastery. The rooms are comfortable, heated with stoves. Overnight at Rongbuk. Drive to Everest Base Camp from Rongbuk Monastery. The base camp is a dry, barren place, but the views of Everest more than make up for this. Have a photo taken a the base camp marker which disappointingly does not even mention the world “Everest” It reads Mt Qomolangma Base Camp and the Chinese below in indicates 5200 metres above the sea level. On a small hill to the left of the base camp marker are a couple of prayer poles. Clamber up for great views of the world’s highest peak. After visit to Everest Base Camp drive to Xegar. Overnight at Xegar.